Today's prompt: Health Activist Choice. Today’s blog post can be about anything you like. Free write! Well, I'm happy the HAWMC prompt today is a free-write! It saves me from writing two posts in one day! Here's the latest on the Reader's Digest drama. None of us who emailed have heard back, except for Kelly, who has been calling and harassing them. She finally got a response from Karen Reynolds, which is sorely disappointing! You can read all about it here. Warning: it will likely make your blood boil! I am quite livid right now. I have seen the comment your publication put on my friend Kelly Kunik's blog, and it is infuriating! I have also read her additional post about her correspondence with you, Karen, and I have to agree with Kelly. I understand you are trying to help people, really I do. 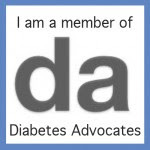 I also realize that you are not the only ones who use the "reversing diabetes" terminology. But your rhetoric is dangerous. Any publication or person who talks about how diabetes can be reversed or cured is recklessly spreading misinformation. THIS IS NOT OK! I stick by what I said in my previous email (which I never received an answer to). I personally know people with Type 2. They have changed their eating habits. They exercise. They've lost weight. And yet, they still have Type 2. They still have insulin resistance and cannot get off of their meds. How do you think that magazine will make them feel? I second Kelly's concerns about this kind of rhetoric affecting research. Both Type 1 and Type 2 need a cure!!!! Karen, I realize you don't think this is a valid concern, but I do. People are not going to want to fund research for any kind of diabetes if they think it can be reversed. For example, Arizona is thinking charging people with diabetes an additional fee for their Medicaid! Seriously! How can you sit there and claim that language like this has no impact? I DO expect to hear back from someone this time! Ok, people. Below is Karen's contact info (also listed on Kelly's post). Please email and call her! Make your voice heard! 750 Third Avenue, 4th fl. Unbelievable, isn't it? Great letter.